Sesame oil has been known for more than 2,500 years, but now it is inspiring new ideas for the treatment of heart disease. Dr. Sampath Parthasarathy, who holds the Florida Hospital Endowed Chair in Cardiovascular Sciences at the College of Medicine’s Burnett School of Biomedical Sciences, talked about his research into the healing traits of sesame oil at the Luminary Presentation Series on April 11. Dr. Parthasarathy is an internationally known cardiovascular scientist who also serves as Associate Director for Research at the Burnett school. “Sesame oil is opening new doors in research,” Dr. Parthasarathy told an audience at the Interlachen Country Club in Winter Park. He cited sobering statistics from the Centers for Disease Control and Prevention about heart disease in the United States: In 2008, more than 616,000 people died of heart disease. In 2010, coronary heart disease alone was projected to cost the U.S. $108.9 billion. Sesame oil is a rich source of polyunsaturated fatty acids, antioxidants, and polyunsaturated and monounsaturated fats that can keep cells and arteries healthy. It shows promise in controlling inflammation of the arteries, which can signal a buildup of fatty deposits, or atherosclerosis, Dr. Parthasarathy said. Dr. Parthasarathy cited a 2009 study from Ohio State University, where he held the Klassen Chair of Cardiac Surgery and Professor of Surgery. Using two groups of mice, he and other researchers looked at whether sesame oil could prevent atherosclerosis. One group received a diet rich in sesame oil, the control group did not. Plasma from the control group was murky, but mice who received the sesame oil had clear plasma. A slide from the control group showed white spots along the inner linings of arteries, indicating atherosclerosis. But arteries from mice fed sesame oil were clear. When asked how he uses sesame oil in his diet, Dr. Parthasarathy said he includes 2 tablespoons daily. He suggested mixing it with peanut butter or using it in salad dressings. In Indian culture, he said people gargle with it to promote healthy gums. Although more research into sesame oil is needed, Dr. Parthasarathy said, he is “excited and encouraged” by its potential benefits. “Dr. 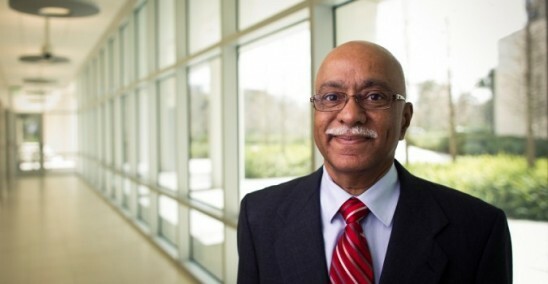 Parthasarathy has dedicated his life to finding causes of heart disease,” said Dr. Deborah German, vice president of medical affairs and dean of the College of Medicine.